In the Text Rain installation participants stand or move in front of a large projection screen. On the screen they see a mirrored video projection of themselves in black and white, combined with a color animation of falling text. Like rain or snow, the text appears to land on participants' heads and arms. The text responds to the participants' motions and can be caught, lifted, and then let fall again. The falling text will land on anything darker than a certain threshold, and "fall" whenever that obstacle is removed. The falling letters are not random, but form lines of a poem about bodies and language. 'Reading' the phrases in the Text Rain installation becomes a physical as well as a cerebral endeavor. Text Rain is a interactive installation that blurs the boundary between the familiar and the magical, corresponding in a unique way to the physicality of the process of reading. 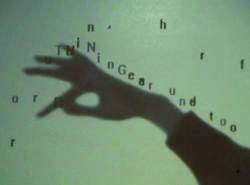 Participants in the Text Rain installation use the familiar instrument of their bodies, to do what seems magical - to lift and play with falling letters that do not really exist. Romy Achituv is an Israeli artist who lives and works in Brooklyn, New York. He studied philosophy, sculpture, and interactive telecommunication in Jerusalem and New York. His work increasingly encompasses a wide range of media, from photography and video to performance art and new media. Through his work, which lies along the axis connecting formal experimentation with personal expression, he seeks to create symbolic structures reflecting upon the medium and beyond. His videos, installations and experimental applications have been exhibited world wide including : Ars Elecronica Center, Linz, Austria; ICC Tokyo; MOCA Taipei; Postmasters Gallery NYC; FILE Electronic Language Festival, Sao-Paulo, Brazil; Cinemas of the Future, Lille, France; and the Israel Museum, Jerusalem, Israel. Achituy's awards include the OLB critics' award at the European Media Art Festival 2000, and a 2000 I.D. Interactive Media Design Review award. Technologies developed by Romy Achituv have been patented by Interval Research Corp., in Palo-Alto CA, and by New York University. Camille Utterback is a pioneering artist and programmer in the field of interactive installation. 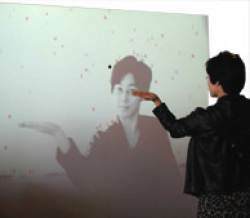 Her work has been exhibited at galleries, festivals, and museums internationally including The New Museum of Contemporary Art, The American Museum of the Moving Image, New York; The NTT InterCommunication Center, Tokyo; The Seoul Metropolitan Museum of Art; The Netherlands Institute for Media Art; The Taipei Museum of Contemporary Art; The Center for Contemporary Art, Kiev, Ukraine; and the Ars Electronica Center, Austria. Utterback's work is in private and public collections including The La Caixa Foundation in Barcelona, Spain. Awards include a Transmediale International Media Art Festival Award (2005), a Rockefeller Foundation New Media Fellowship (2002) and a commission from the Whitney Museum for the CODeDOC project on their ArtPort website (2002). Utterback holds a US patent for a video tracking system she developed while working as a research fellow at New York University (2004). She was selected as a member of the 'TR100 - the top 100 innovators of the year under 35' by MIT's Technology Review (2002) and by Res Magazine as artist pick of the year for their "Annual Res 10 - Ten people who are making a difference in their field" (2000). Her work has been featured in Art in America (October, 2004), Wired Magazine (February 2004), The New York Times (2003, 2002, 2001), ARTnews (2001) and many other publications.